So, if you thought last month was out there, you haven't seen anything yet. Fichte, we will recall, had postulated consciousness, subject as differentiated from object, as the noumenal, absolute reality of our existence, as it is in itself. This absolute subject posits itself as itself, to be the phenomenal self, and as not-itself, to be the phenomenal world that is a representation to the self. Furthermore, in doing so there is a kind of primal metaphysical rupturing, a sundering of the Absolute Spirit from itself to become finite, limited, "posited". There is a primal freedom to this act, for the self or "I" is primordially activity, not substance, verb rather than noun. It can therefore be its own cause, unlike substance in extension, in time and space, each component of which is always effect of some other component, each aspect determined, mechanistic, Cartesian, not free. The world negates the freedom of the I. "The not-I negates the I." The I, consciousness, in the limited aspect to which it appears to itself, becomes absorbed by the not-I, which determines it. But the freedom of the I remains innate, latent. The I can in turn determine the not-I, it can act in freedom. How to understand philosophically this possibility of freedom is a central concern of Fichte's immediate successor, Friedrich Wilhelm Joseph von Schelling (1775-1854), who is the subject of tonight's lecture. We will proceed with a summary of his metaphysical position. Our text is System des transcendentalen Idealismus , or System of Transcendental Idealism , written in 1800 while Schelling was teaching at the University of Jena, lecturing alongside Fichte. This work is important because, in addition to being highly influential (Coleridge plagiarized sections of it in Biographia Literaria ) its structure is the basis for Hegel's Phenomenology of Spirit , which we will be studying in the next class. Schelling begins the System with a reassertion of Fichte's position. He starts where the Wissenschaftslehre leaves off, attempting to expand on its implications. Therefore the realization of consciousness' identity with itself, which is the central insight of the Wissenschaftslehre , is also asserted by Schelling. He calls this activity of self-recognition "self-consciousness". Therefore the self is not a substance, a thing or object but is rather discovered to be pure activity. Furthermore, it is its own activity, both actor and that which comes into being through its own action. The self is indeed an object, but only for itself, and is thus not originally in the world of objects; it first becomes an object by making itself into an object, and does not become one for anything external, but always only for itself. That is to say, matter exists essentially, in terms of its metaphysical nature as appearance (vorstellung) to self-consciousness, towards a being that is for-itself. Regarding the relationship of self-consciousness to the phenomenal/noumenal distinction of Kant's Critical Philosophy, Schelling states, "The question whether the self is a thing-in-itself or an appearance is itself intrinsically absurd. It is not a thing at all, neither thing-in-itself nor appearance." (pg 32) The self, as an absolute metaphysical ground, drops out, as it were, from the whole network of the categories of phenomenal reality. It is unique, not really part of the universe at all, but rather its transcendental ground. Therefore, self-consciousness, in virtue of possessing this ontology, is free, because it is not part of the system of causal determinations of the universe. Or, as Schelling remarks, "Anyone who has followed us attentively thus far will perceive for himself that the beginning and end of this philosophy is freedom, the absolute indemonstrable, authenticated only through itself. --That which in all other systems threatens the downfall of freedom is here derived from freedom itself. --Being, in our system, is merely freedom suspended." (pg 33) Being, by which he mere means nature, the world of forests and galaxies and societies in the not-I, the object in opposition to the subject, that which negates and nullifies the freedom of the self. How, then, are we to be free? In the next section of the System of Transcendental Idealism Schelling begins to formulate what he calls a "history of self-consciousness". He argues that the self contains both subject and object as it is the ontological ground of both. The self is both itself and that which limits itself. Here, stated clearly for the first time in the texts we have covered in this series, is the basic form of the dialectic as used by Hegel. There is a thesis, whose ontology implies or manifests its own opposite such that it negates itself, leading to the positing of a third term to mediate between the initial dichotomy. Do we not see here, in this thinking, the fundamental grammar of non-dualism as it appears in German Idealism? For the mediating third term is found to be a restatement, in an evolved fashion, of the initial thesis. The series, which can be continued with each new synthetic term becoming a new thesis, therefore simultaneously evolves the initial absolutely spiritual thesis through a process of becoming, and also returns itself to that principle at each step, to rediscover the non-dual identity of the system with its metaphysical ground at each point. Therefore, for Schelling's System , self-consciousness has entered into becoming, into history, by being both the absolute self positing consciousness as well as the mediation between that subject and its limiting objects that are its representations. By entering into such mediation, however, self-consciousness has separated itself from itself and must, as it were, refind itself through the stages of the System . In so doing, self-consciousness will refind itself as its own essence, which is freedom. This, then, is what is meant by the "history of self-consciousness". There is a continuation in this movement of a theme from Fichte, namely that of the striving. The finite-I, we will recall, in its self-limitation from the absolute-I has undergone a separation from itself. It therefore posits the ideal of the absolute-I to itself and strives after this. Likewise, in Schelling there is a movement within the I, within self-consciousness, to return to itself, in recognition of itself as the spiritual reality, the presence of the absolute spirit to itself. The first stage in the history of self-consciousness is self-consciousness itself, which is the foundation of the whole system. Self-consciousness now comes into initial contact with the not-I, with object opposed to and limiting its subject. This occurs through sensation. Schelling writes, "The self is the absolute ground of all positing. For something to be opposed to the self means, therefore, that something is posited which is not posited through the self. The intuitant must therefore find in the intuited something (the limitation) which is not posited through the self as intuitant." (pg 54) Or at least, the object appears to posit itself to the subject as that which is autonomous, or outside of the self, i.e. as being a thing-in-itself. However, this is really an illusion, for the object is a representation in sensing, and is therefore really, for the philosopher, a presentation of the self to itself. Thus the whole odyssey of self-consciousness through its stages occurs purely internally, that is ideally, as a movement of an absolute metaphysical reality within itself. Upon the basis of its sensation of the object, self-consciousness is able to make of itself an object, to intuit itself to itself. In doing so self-consciousness moves from merely being ideal to itself to being real to itself. Schelling calls this productive intuition, for the reflexive self-knowing is an activity, or productive movement of the self-consciousness which, as previously remarked, is essentially activity. By raising itself to this level of self-cognition, sensation becomes not merely pure object to the self-consciousness, in which the I is, to itself, fully absorbed and hidden within the representation of the object. Rather, sensation becomes sensation of object to a subject. Therefore, the full (assumed) relationship between subject or consciousness sensing an autonomous object, or world, is now established, Schelling asserts, out of self-consciousness. 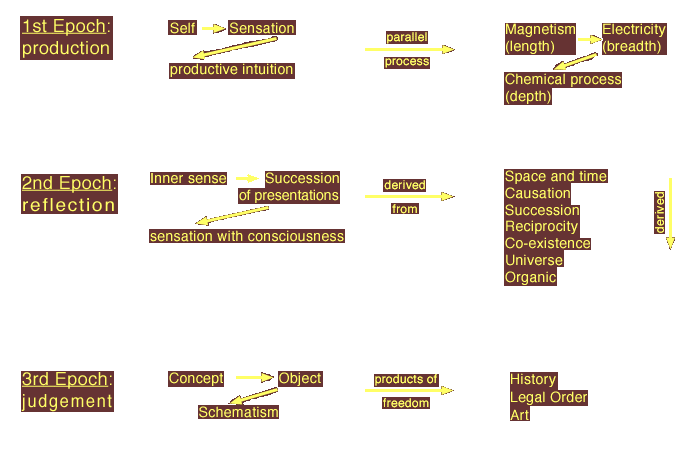 In facilitating this movement, the productive intuition oscillates (schweben) between subject and object, Schelling describes, mediating between their opposition and producing the synthesis of their relation in and through self-consciousness. We should pause here for a moment and discuss the philosophical intelligibility of this argument. We began with what seemed a valuable and important insight, namely that of the self-identity of consciousness. It seemed that this implied a non-reducible quality to the self, and that there might be implications from this regarding freedom and other issues. However, rather than developing these implications in a way that we as modern readers would find adequate, the text instead develops itself in a manner that it is hard not to find rhetorical at the expense of real content. Has anyone here been convinced by the argument for productive intuition that external reality is a direct metaphysical projection of an absolute subject, on the basis of Schelling's specific argument? Rather, haven't we detached ourselves entirely from our concrete phenomenon, namely consciousness, and extended ourselves into exactly the kind of pure metaphysical speculation that the Kantian Critical philosophy was intended to reject? Let us return to our text. The System of Transcendental Idealism has reached the point of positing the object to the subject through the activity of the productive intuition. This object is matter, Schelling asserts, and he now theorizes three movements in the construction of matter, as a parallel process to the first three acts in the history of self-consciousness in its first epoch. These are magnetism, electricity, and chemical process, the forces that constitute matter in the System . "As surely as the two now completely separated forces are originally forces of one and the same point, so surely must this cleavage occasion a striving in both for a return to unity." (pg 88) There is a kind of animism here in this striving of forces which is characteristic of Romanticism generally, as surely in Wordsworth as in Schelling. Furthermore, this striving is a reflection of the striving of the I to return to the absolute that is itself. Surely this is a religious, even a mystical logic in which the created creature returns to its divine source in the unity . Schelling writes, "In the first epoch of self-consciousness we could distinguish three acts, and these seem to reappear in the three forces of matter and in the three stages of its construction. These three stages of construction give us three dimensions of matter, and these latter, three levels in the dynamic process. It is very natural to hit upon the idea that it is always just one and the same trinity that recurs among these various forms." (pg 90) Here completely and clearly stated is the essence of the Hegelian dialectic. So Schelling is the true culprit! In any case, let us now examine the second epoch in the history of self-consciousness. The productive intuition having mediated the positing of object to subject, there is now a full bifurcation of consciousness into an inner sense, namely the content of though independent of sensation, and a succession of presentations appearing as the sensory object. From this pair is in turn derived their mediating factor, which is also their unity. This is sensation with consciousness, which is a further development of the I or self-consciousness, to which the System always returns as its ground and unity. Causality now gives rise to the pheonomenon "of an involuntary succession of presentations" (pg 108) to the subject, that is a succession of representations whose content and ordering are not subject to the immediate volition of the self in the same manner as the content of inner sense. This in turn gives rise to a concept Schelling calls reciprocity. Schelling asserts, "No causal relationship can be thought of without reciprocity, for no relationship of effect to cause is possible, i.e., the above-required opposition is impossible, unless the substances, as substrate of the relationship, are fixed by each other." (pg 118) Or to translate this out of Schelling-speak, for the objective world to have consistent causality all its possible parts must relate to each other causally. This means they are all parts of a common continuum, which gives rise to the next derivation, which is coexistence. Self-consciousness now finds itself not merely positing the abstract form of time, but in time -- continually synthesizing itself as a present moment. Here there is a further sundering of self-consciousness from the absolute self. Here then is the gnostic myth, or rather might we say the gnostic grammar. The divine pleroma of the absolute consciousness has become sundered from itself and become enmeshed in matter, yet remaining in fundamenta opposition -- pneuma versus hyle. Indeed the organic is now derived as existing within the universe, completing the fall of consciousness into embodiment. Only here for the first time in the System is Schelling talking about a body or organism that the self has any kind of relationship to. Prior to this derivation self-consciousness has solely been in an abstract position with regard to an object. So there we have it. The System has derived the whole of the physical universe from the I. The self "has transformed itself, for itself, into the thing-in-itself" (pg 97) -- that is, into an object. The System cannot come to rest with the second epoch if it is to accomplish the task set to it by Schelling, namely to demonstrate the freedom of the self. The second epoch is the epoch of relation, and the subject has come into relation with the object through representing itself as an organism, i.e. a body alongside other objects in a world. Therefore the self has limited itself in so doing, for it now appears to itself not as subject, but as object. How is it both to know and be its freedom in these circumstances? Let us now examine the third epoch of the history of self-consciousness, whose task is to derive the next step in the self's coming to consciousness of its own freedom. The issue of the third epoch, like those of the previous two, is to determine the mediating basis of the relation of subject and object, and to discover this in an aspect of consciousness. Thereby the object is found to be ontologically grounded in the subject, which is the whole project of idealism. At this point in the history of self-consciousness the I has completed the arc of its external positing, resulting in the coming to be of the external universe as Vorstellung. The self is now at "the standpoint of reflection" (pg 134), and all further derivations in the System are analyzed by reflection from the totality already synthesized from the activity of the absolute I. Through reflection, then, the self must raise itself to self-consciousness so that it can return to itself. It is completing a circle of its own device to know itself in and as that circle, although this is concealed from itself by itself until the last act of the dialectic. Is this not a theodicy? Is this not the same underlying logic as that of the mystical hadith sacred to the Sufis that has God say: "I was a hidden treasure that longed to be known, therefore I created the universe"? Schelling writes, "Since the intelligence, so long as it is intuitant, is one with the intuited and in no way distinct therefrom, it will be unable to arrive at any intuition of itself through the products until it has separated itself from the products." (pg 134) Consciousness must now differentiate itself from its object and see itself as separate -- that is, to see itself as subject. Schelling writes, "Since the intelligence, so long as it is intuitant, is one with the intuited and in no way distinct therefrom, it will be unable to arrive at any intuition of itself throught the products until it has separated itself from its products." (pg 134) Consciousness must now differentiate itself from its object and see itself as separate -- that is, to see itself as subject. The mediating act in consciousness between concept and object is judgement, which is a technical term derived from the Kantian philosophy. The third of Kant's Critiques, we will recall, is the Critique of Judgement . This is the basic crux of the third epoch. The self actualizes its free nature through its activity in the world, which activity unites subject and object through the mediation of the subject's productive action. For Schelling art and the aesthetic will become, at least in the System of 1800, the ultimate expression of the Self's freedom and its showing of the same to itself. But do we not also see here a shadowing forth of the Marxist conception of human nature as productive capacity? When Marx, in the Grundrisse for example, theorizes human productive power as the starting point for the dialectic of historical materialism, is he not reversing German Idealism exactly as he claims? ("Turning Hegel on his head," etc.) For in idealism, human activity in-the-world is derived as a projection of a universal consciousness, whereas for historical materialism consciousness is derived from human productive activity in-the-world. Material production is the base for the superstructure of individual self-identity, self-reflection, society, culture, history, religion, and art. Heideggers' conception of Being-in-the-world also seems derived from the context of these ideas in German Idealism and the Marxist philosophical tradition. Human behavior, i.e. pre-cognitive skillful coping with the equipmental totality in circumspective concern, is the epistemic basis for cognitive noticing , for the coordination of concept and object, rather than in a mental act of the Cartesian thinking subject. Although, as with Marx, Heidegger displaces the Cartesian self-consciousness from the center of the actiton, Heidegger also rejects Marx's materialism. Rather, he concludes on the basis of the existential analytic that the ontology of the present-at-hand of object as bare spatio-temporal extended presence is itself privative and derived from the more primoridial ontology of the ready-to-hand and of the self-disclosure of Being as temporality. We have described the main movement of the third epoch in the history of self-consciousness. Schelling continues in this section to derive the various synthetic a priori categories of the understanding as they appear in the Transcendental Logic of Kant's Critique of Pure Reason . As we skipped that section in our discussion of Kant, we will skip this corresponding section in Schelling. This brings us to the end of the third epoch, which also concludes the section of the System related to theoretical philosophy. There is a following section which, like in Kant, explores practical philosophy as it derives from and relates to the former. Our theme being non-dualism, our concern is largely with the ontology of the figures we are covering. Therefore, we have focused our attention on the theoretical, rather than the practical, part of the System . One component of Schelling's practical philosophy we will examine is his view of history, as this is crucial to understanding the Hegelian and Marxist conceptions of history. History, Schelling says, is "a union of freedom and necessity." (pg 208) That is to say it unites the free activity of the totality of subjects with the world, which is causally necessitated in itself. Thus, the free activity of the self-consciousness is able to realize itself in striving after its ideal. This ideal the self strives after is a concept found in Fichte's Wissenschaftslehre , where the finite-I posited its absolute, noumenal aspect to itself with the imagination as an ideal. Schelling pushes this ideal out of the imagination and finds it within history itself, as a process of progress. If the moral legal order and the teleology of history are both expressions of freedom in the world of appearance, then art is the fullest such expression. Art and the aesthetic are the climax of the System , the completion of the history of self-consciousness. Art, as with history, is a unity of the activity of the free subject and the necessitated natural order. In this it follows the general form of the System , where the duality of subject and object, reappearing in a new guise at each phase of philosophical deduction, is bridged and united by the discovery of a mediating activity that is found to be the expression of the essential metaphysical subject behind and supporting the pairs of opposites. There is an act of self-recognition of the absolute subject being described here, resulting in a state of "infinite tranquillity". Is this not clearly akin to a species of gnostic epiphany? Is this not similar in form to the philosophic import of the essential Upanishadic dictum "Thou art That"? Is this not, in short, non-dualism? Finally, although he rejects art as the final resting place for his own system, Hegel also aims for a self-recognition of the absolute self in and through the phenomenal subject as the goal and end of human knowledge. Schelling, F.W.J. (tr. -- Peter Heath), System of Transcendental Idealism (1800) , University Press of Virginia, Charlottesville, VA, 1978. Wed, 24 Apr 2019 1:49 PM.